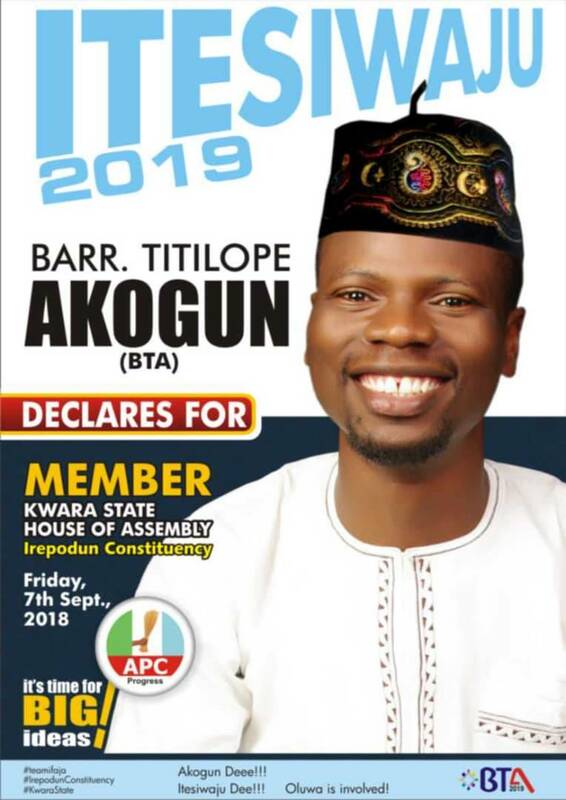 Baring any change in plans, the Itesiwaju Irepodun Captain; Barrister Joseph Titilope Akogun (BTA) is set to declare at his IFAJA ward, in Omu aran on Friday 7th September, 2018. The people of Irepodun Local Government have in time past been agitating for a leader who understands what it means to represent them. 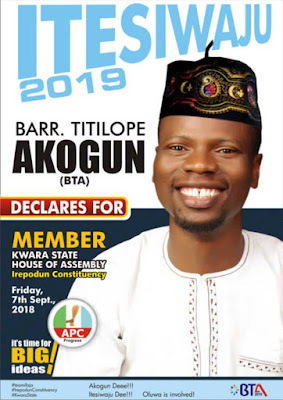 Until the entry of Barrister Akogun into the Irepodun Constituency race, the people were almost giving up. Years have past, things have remained unchanged positively. The people of Irepodun have groaned in pains for years as their banks remained shut down, their voices are not heard, as they do not even recognize their representative let alone see the representation they've been yearning for. A representation that truly cares and carry them along in decision making. How can you represent people you have refused to dialogue with in years. But the 4 cardinal ideological campaign of this Omu aran born lawyer is really changing the tide of things in Irepodun Local Government. After his declaration at the Olomu way of the Party Secretariat by 3pm on Friday, 7th September, Barrister Akogun would be featured on Royal FM on Saturday, and his tour of all the 11 wards of Irepodun Local Government commences. All things being equal, we are set to witness a new type of politics and governance that transcends the rhetorics of the past. It is a new dawn in Irepodun Local Government. 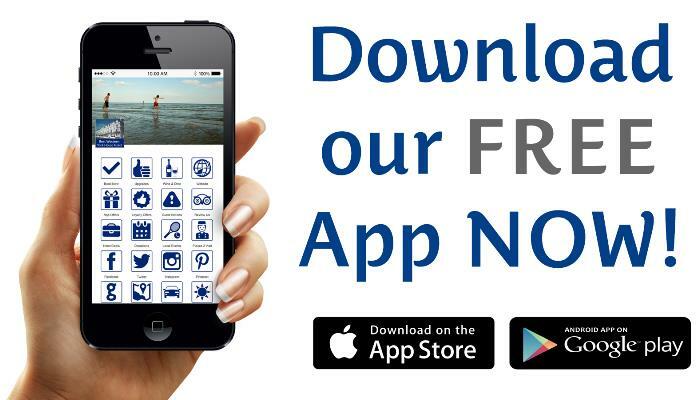 It's Time For BIG IDEAS! Barrister Joseph Titilope Akogun. (BTA).